The library houses a growing collection of genealogical resources. The Genealogy Area is located on the second floor of the Downtown library and has a special emphasis on Spokane, Eastern Washington and the surrounding states. We also have several tools available online to assist with regional research. New to genealogy and need some help? Please contact the Eastern Washington Genealogy Society for assistance. If you have been researching for a while and have hit a dead end or have a question about resources, you can book a librarian here. Search our records of more than 100,000 regional obituaries. This is a comprehensive record of obituaries since 2008, with some addional records dating back to the early 1900s. This search will return the person’s name, the publication the obituary appeared in, as well as the publication date and page. You can then use the results to make an accurate search in the appropriate publication. This free database is an obituary index of the Spokane papers from approximately 1940-1979. It was compiled by Lee Patchen and made available online by the Eastern Washington Genealogical Society. You can search recent obituaries directly on the Spokesman Review page at legacy.com. You can also use the advanced search to narrow down your search. FamilySearch is an free online database provided by the LDS church. It includes birth, marriage and death records as well as most U.S. Census records. More information is added daily by volunteers. The Washington State Digital Archives contain electronic indexes and records from both State and Local databases, including Marriage Records, Naturalization Records, Census Records, Death Records, Birth Records, Military Records, and Institution Records. Are you doing research from outside the greater Spokane area? Our librarians can search our records on your behalf for death notices. We will search for 3 announcements at a time and will search the newspaper for 5 days after an event date. You may interlibrary loan a microfilm copy of the newspaper from the State Library if you wish to continue the search yourself. This service is for out-of-town customers only. If you live in the Spokane area, we ask that you come in to do your research. Some of the digital archives curated by the Northwest Room might be useful in your research. For over 100 years, librarians at SPL clipped the newspapers for biographical information. These clippings include obituaries on pioneers, but they also contain all kinds of biographical information from papers in Spokane and around the Northwest. Several hundred Spokane high scool yearbooks are now available online. You can view these yearbooks in your web browser without downloading any files or additional software. These yearbooks are searchable, so if you have a name of someone who attended high school in Spokane take a look. We have collected quite a bit of information on researching house history and previous ownership using public records. These collections emphasize the homes, buildings, streets and activities in and around Spokane. They might provide some interesting context to your search. 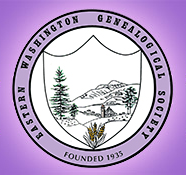 The Eastern Washington Genealogical Society is here to help you! Beginning researchers are encouraged to visit. Please call 509-444-5357 or email askewgsi@ewgsi.org if you are coming from out of town or to make an appointment with the genealogists. Check flyers posted in the Genealogy Area for information on workshops, beginner classes, luncheons and other activities. Please feel free to attend all functions…and you are also invited to join the Eastern Washington Genealogical Society. Follow our Obituary Goddess to stay up to date with the past!